Onwards out of Manchester. Past some famous landmarks on the way, back to Waters Meeting and another right turn. Still on the Bridgewater Canal and past some more interesting graffiti. Over the Barton Aquaduct (more about that later) and on to Worsley where the canal water turns orange because of the iron ore deposits. To us it looks like Heinz tomato soup. The iron ore used to be mined here at Worsley Delph and was transported by canal boat. The small central section of black and white timbered house is actually for sale currently… such a picturesque location, I can’t imagine it will be for sale for long. I did, of course, have some crochet to do on the way. I have begun a Wisteria Way Shawl (pattern by Lisa Cook) using the Green Tea Tipple Whirl. I was a bit intimidated by the pattern (and particularly the new, revised version which was written out in full making it incredibly detailed and huge) so decided to stick with the original version which explains the different parts of the pattern and then abbreviates the pattern to each part. Now I have got going i can pretty much remember each part so only need to check what happens with the increases. The #floatiest sign is actually made of yarn! Square patches of different colours and designs were knitted and joined together to cover the letters. It was produced during a project for the Bridgewater Canal in Salford run by ArtYarn. I love it when I accidentally find some yarny canal connection!! 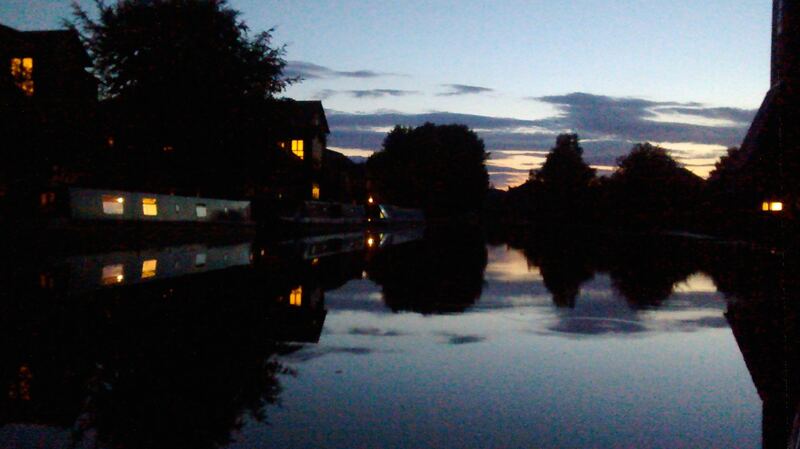 The picture above shows an evening scene from our furthest point on the canal this time… Leigh (in Lancashire). Because we only had a week, and the restrictions imposed by the lack of water, we couldn’t complete a circular journey so had to be content with “there and back again” (… see how far it is!!). In the morning we found a winding hole (a wider section of the canal which would allow us to “wind” the whole 61ft of boat) just under the bridge behind us and turned the boat around to go back the way we came. But the fun was not yet over. We get to see it all a second time on the way back!! We had also arranged to meet up with my BigLittleSis and her family for a bit of a cruise. We picked them up just before the Barton Aquaduct which is actually a swing aquaduct that allows the canal to cross the Manchester Ship Canal. It swings to allow larger boats/ships to pass. When we arrived at it it was closed for a ship. This is pretty exciting to us because it’s rare to arrive just at the time when a boat is passing but for my BigLittleSis, who lives nearby, it happens often at the road bridge and usually when you need to get somewhere quickly!! On the top left picture you can see a tiny flash of red on the metal bridge…. that is the ship going past. There is video of this on my Instagram feed too. This is the final instalment of this years canal adventures (did I hear you say “phew”!!!). I hope I haven’t bored you too much!!! By the time you read this we will be on the next part of our summer holiday adventures so I maybe MIA for a while. I will no doubt be on Instagram though so catch up with me there. Previous PostBees, Graffiti and Art. Next PostBook-fest but Yarn-drought (Yarning Along 18). Awww thank you. What would I do without you!? Thoroughly enjoyed the trip. Love the yarny canal connection. The shawl will be very pretty. I love a yarny canal connection too – they happen (in different ways) more often than you would expect! !